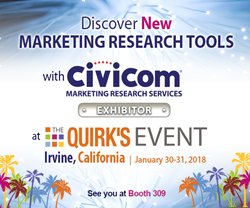 Leading marketing research solutions provider Civicom is showcasing its wide range of telephone and web-enabled marketing research services as an exhibitor at the Quirk’s Event in Irvine, CA on January 30-31, 2018. Civicom has been a charter sponsor of Quirk’s Events since its foundation in 2015. Civicom continues to develop project management tools that will aid market researchers in delivering powerful insights to their clients. Civicom is thrilled to participate again in this year’s marketing research and consumer insights expo organized by Quirk’s Media. The industry expo is highly recommended by market researchers as it delivers the latest industry insights through a diverse line-up of expert speakers and exhibitors. Touting “Big Ideas, Real-World Solutions,” this year’s event will treat attendees to nearly 40 sessions of demonstrations and workshops that will tackle the upcoming trends and methods in the fast-paced world of marketing research. Civicom’s exhibit for this year’s two-day expo will feature new project management solutions for researchers who delve in web-enabled marketing research. The new tools will complement and strengthen deliverables from web IDIs and focus groups, empowering market researchers in delivering the best insights to their clients. Civicom Marketing Research Services also fervently anticipates the huge networking opportunities in this year’s Quirk’s expo. In bringing together like-minded industry professionals – from marketing research service providers, corporate researchers, to marketing research clients, Quirk’s Events have consistently empowered the marketing research industry to learn and further improve tools and techniques in the industry through innovative inclusion and collaboration. Quirk’s Event attendees are invited to learn more about Civicom’s leading edge suite of marketing research solutions at Booth 309. Quirk’s Media started out as a means for marketing research providers to promote their products and services. The company has been doing so for nearly three decades. This is still its main thrust today through Quirk’s Marketing Research Review, an industry publication covering the full realm of marketing research interests. Also published by Quirk’s is the Quirk’s Researcher SourceBook™, a specialty directory of research providers, which lists over 7,100 companies worldwide. Civicom’s proprietary global audio and recording platforms, plus web-enabled tools, operate in virtually every country in the world. Civicom operates 24/7 every day of the year with a dedicated and trained service team of ‘CiviTechs,’ assuring clients that no matter where their project is located, Civicom will be able to facilitate it. Civicom operates in over 96 countries and offers extensive translation services for marketing researchers. All services are available in Spanish, as well as English, and multiple other languages. Civicom is the global leader in facilitating telephone and web-enabled IDIs and Focus Groups using Civicom CyberFacility®. Civicom also offers Civicom Chatterbox®, an online research platform that operates globally and is available for individual or multi-country studies, plus Civicom InSitu® Mobile Research, a qualitative tool for audio diaries and patient journeys. Additional services include Civicom FrontRow™ Mobile Ethnography, transcription services through TranscriptionWing™, and respondent recruiting through CiviSelect™. The company also offers See Me Navigate™ for assessing mobile usability, enabling researchers to view a respondent’s mobile device remotely through online technology to conduct mobile app and mobile web usability research while the respondent engages with their mobile device. Civicom Marketing Research chooses to be as dynamic as it is innovative; always listening to and acting on clients’ ideas and requests as they see fit. This kind of relationship has paved the way for the development and rollout of new services.